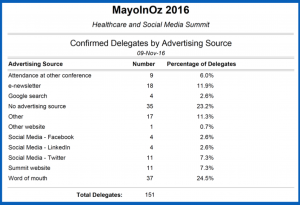 We are on the heels of our second international healthcare and social media summit in Australia, affectionately hashtagged #MayoInOz. I was again tasked with social media advertising for the conference. Last year I shared our positive return on investment (ROI) from advertising in a summary blogpost, “Demonstrating ROI of Social Media Ads for Events." This year I’d like to hone in further to a more tactical review. This requires selecting two examples for this blogpost. Before getting into the advertising weeds, let’s look at the big picture. In total, we tracked eight individuals from the advertisements through registrations. Through a questionnaire participants answered at registration, we also know that at least 19 registrants found out about the event through Facebook, Twitter, and LinkedIn. Most of the self-reported social media registration referrals came from Twitter, which is where the bulk of this blogpost will focus. 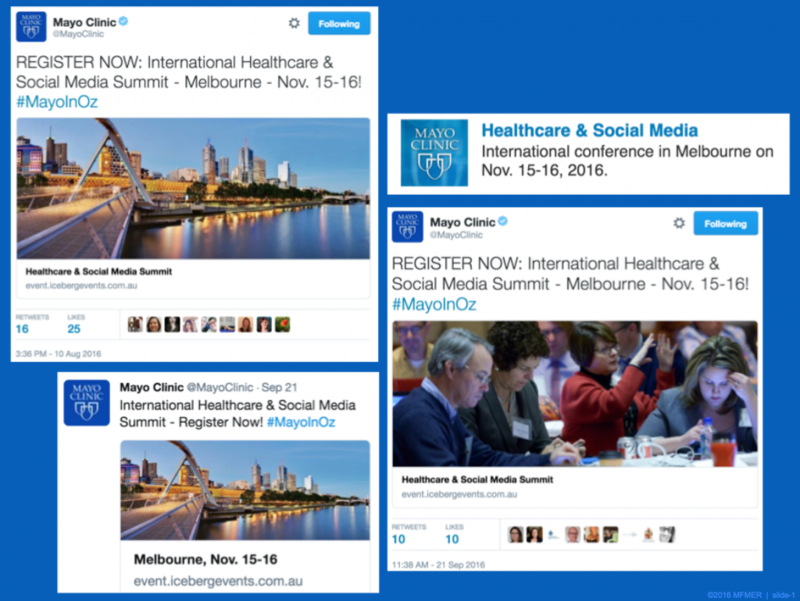 Our first Twitter ad campaign for #MayoInOz consisted of creating a keyword-based target audience within the Australian state of Victoria. We were more accustomed to Facebook advertising, but since Facebook and Twitter differ greatly in the way an audience can be targeted, we had to radically shift our thought process for how to reach our intended Twitter target audience. On Facebook, the target audience can be defined using “OR” and/or “AND” conventions. We have the option on Facebook to say we only want to target those who both work in healthcare AND in social media, allowing us to get more specific. However, in Twitter advertising, the "AND" convention is not available for audience keyword definition. We were constrained to think through "OR" keyword selections. This meant that anyone who fell within any one of the interest-based keywords could be served our ad. For example, if we use keywords “healthcare” and “social media,” the Twitter ad could be served to someone who works in social media for a fashion brand, as well as someone who is the CEO of a hospital. They only need to identify with either of the keywords. The keywords, therefore, need to be narrower. Some of the keywords we tested were: #hcsm, #healthcaremarketing, #digitalmediamanager, and #healthcaresm. For brevity within this blogpost, we’ll call this keyword advertising approach Campaign #1. We also wanted to try building a lookalike audience to our MCSMN basic and premium members. This process involved uploading a list of email addresses and asking Twitter to find accounts with similar features. Twitter must first see if they can match the email addresses we provide to actual Twitter accounts. Twitter quoted us an average match rate of 20%. The minimum amount of matches they would allow to successfully create a lookalike audience was 700, which meant we needed an initial email list of about 3500. We provided them with a list of about 8000 email addresses, and initially about 2700 were matched. This was an above-average match rate of around 34%. However, within about a week, the list of Twitter matches dropped to 1,140. How was that even possible? Twitter explained that this usually happens due to later realizing some of the accounts were spam or had been deactivated. Our final match rate was about 14%. The potential reach was still very small. We regularly underspent the allotted daily budget and only received 43 total clicks. This is another unique aspect of Twitter (and LinkedIn) advertising versus Facebook, because it seems Facebook always finds an audience for your ad, rarely allowing an allotted budget to go unspent. So while I wanted this Twitter lookalike audience to have greater reach, I appreciated that Twitter held fast to the parameters we had specified. This lookalike audience approach will now be called Campaign #2. As a reminder, while Campaign #2 necessitated a wide geographic audience (multiple countries), Campaign #1 allowed for a tighter geographic purview (one Australian state). Now it’s time to compare the results. The click-through rate on Campaign #2 was significantly larger (0.79% to 0.25%), but its potential reach was too limited to be impactful enough by itself. ln order to reach more of our desired Twitter audience, we had to rely on both campaigns. We only tracked the UTM code of one registration directly back to a Twitter ad, but there were 11 individuals who self-proclaimed to have heard about the conference via Twitter. While it is possible organic posts influenced this discrepancy, many who initially received the ad likely switched devices before registering. We know that out of the 897 click-throughs on our Twitter ads, all but 32 were done on mobile devices. I would suggest many mobile users were interested enough to click through on the ads to learn more information, but most people probably wouldn’t register immediately via their phone. How do I know those who clicked through on the ads were even interested in the conference? Great question! Twitter also had the highest average time spent on the event site, which was a strong indicator of interest and that we had reached the right audience. Average time on site for a Twitter click-through was 3 min. and 4 sec. – compared to Facebook's 43 sec. and LinkedIn's 1 min. and 41 sec! This provided evidence that Twitter is a strong contender for our social media event advertising. 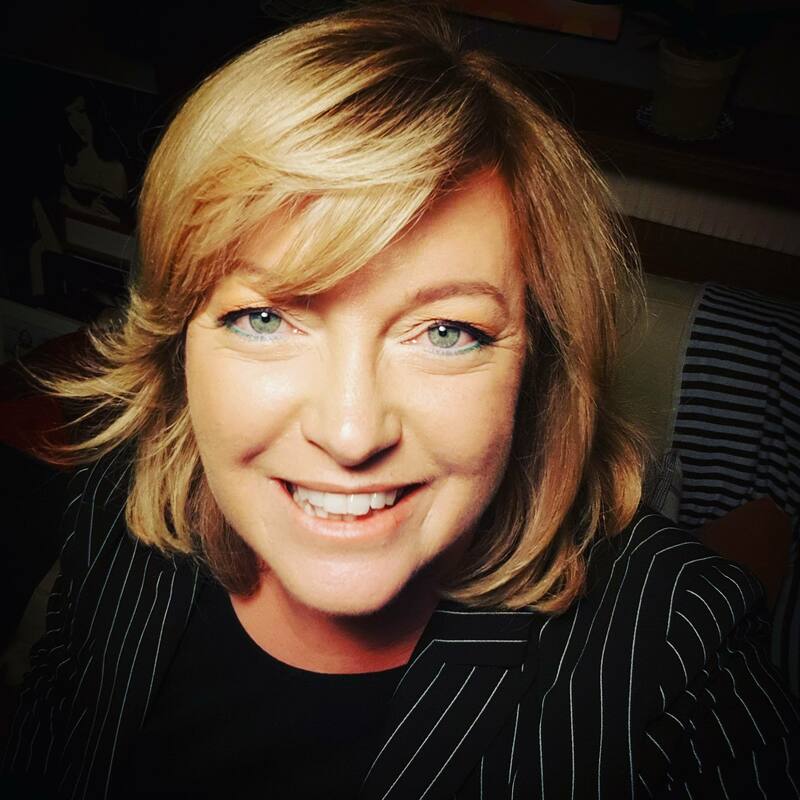 While the keyword selection process required a significant shift in how to define our target audience, the new approach still proved successful at finding the right audience who would spend more time on the event website. In the future, we hope to utilize the lookalike audience option while recognizing the need to maintain a combined approach with Twitter keyword selection advertising in order to reach a sufficiently large audience. 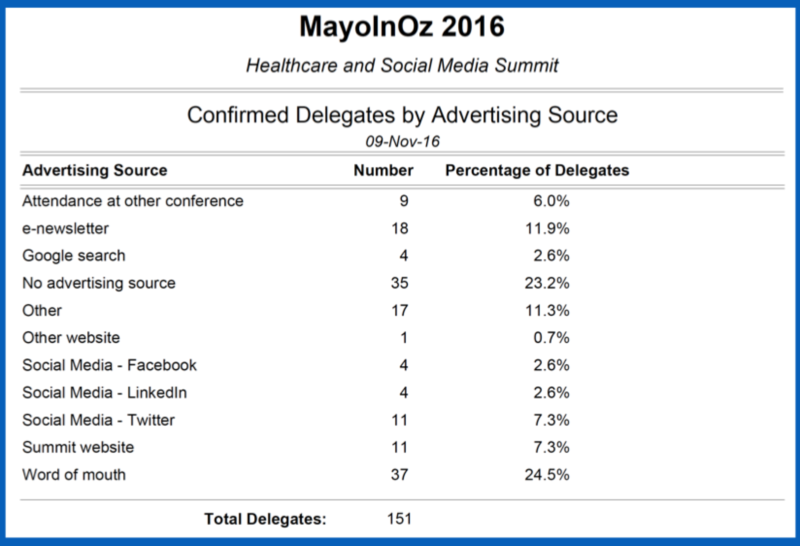 We are on the heels of our second international healthcare and social media summit in Australia, affectionately hashtagged #MayoInOz.